Bungie and Activision have announced Destiny: The Collection, a compilation of every Destiny expansion and the base game for $60. This announcement comes three weeks after the collection showed up early on Amazon. The collection will include Destiny, The Dark Below, House of Wolves, The Taken King, and the upcoming Rise of Iron expansion. Those who pre-order the collection digitally will immediately have access to the game and all current expansions. Additionally, Destiny: The Taken King owners still on Xbox 360 and PS3 will have the option to purchase Destiny: The Collection digitally for a reduced price of $40 on current-gen consoles. 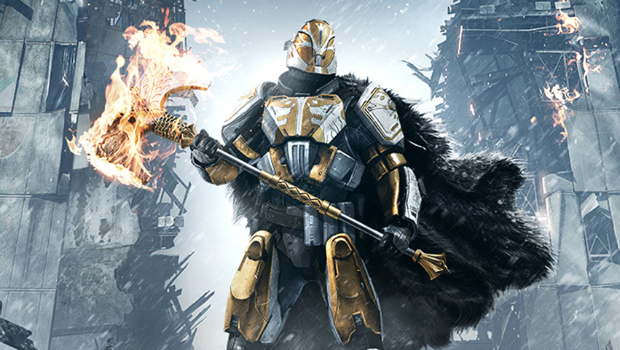 Those who pre-order the collection will receive the black and silver Iron Gjallarhorn weapon as well as the Iron Gjallarwing Sparrow. The collection is available for pre-order on Amazon for PS4 and Xbox One. Destiny: The Collection will be released September 20, the same day as Destiny: Rise of Iron.